Shortly after gold fell to $1,046 in December 2015, I called for a bear market rally that ranged from $1,375 to $1,428. That low mark of $1,375 has been tested three times since without being able to break above. Gold has been steadily down since the third test on April 11th. I first warned our Boom & Bust subscribers on June 4th that a break below the late 2016 rising trendline would likely trigger a further fall. Gold went straight down from there. After giving a sell signal at around $1,290, it has now tested a second bottom trendline that extends back a year earlier from the major low of $1,046 on December 11, 2015. Yesterday’s low should be the final support, which will be a “make or break” point for gold. Then the next real support is back at that $1,046 to $1,050 range. After that, it’ll drop to the lows seen in late 2008 around $700. Silver is at a similar critical level. It was just under $16 on Monday, and has been tested several times since late 2015. Gold is oversold short-term, and is bouncing a bit this (Tuesday) morning, as expected. This bounce could easily go back to $1,270 or so. But a clear break of this rising bottom trendline ahead would be the last stand for gold. Mark Hulbert, a financial analyst, measures long-term sentiment in many indices. He doesn’t see gold at levels that invite a major bottom and rally ahead. His sentiment indicator for gold is at -13% on Monday against -30%, which is more ideal for major bottoms. He says gold bugs are only moderately bearish, but that’s not bearish enough. The dollar has also been rallying from its lows of 88, and is trying to break above the resistance at 95. A break like that would be further bearish for gold. Gold trades in dollars and a rising dollar means falling gold prices. The rise in short- and long-term interest rates prompted by the Fed don’t agree with gold either since it yields no interest to compete. And that looks to continue for many months ahead. Now, if gold were to mount a strong rally and break above $1,375, then that could actually be a bullish move that projects it towards $1,650 or so. This is what bitcoin is doing after testing the critical $5,800 to $6,000 levels that I recently warned about. But, again, that doesn’t look likely. So, how much do you love your gold? This isn’t favorable for gold since it hasn’t fully deflated from its bubble that peaked in September 2011. Gold’s bubble deflation requires the minimum of a $700 low – the level seen in the 2008 crash. It’s bubble action (bubble origin) started in 2005 at $450. That would be the ultimate deflation and low for this bubble. If that happens, then load up the truck and get ready for the next long commodity and inflation cycle. 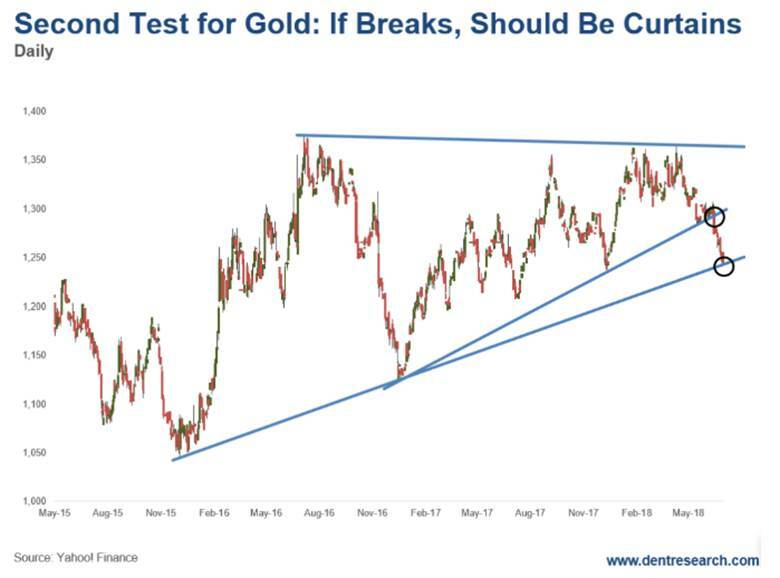 One where gold could see something like the $5,000 that gold bugs are forecasting – it’s just that they will be dead by then! If you make the rational decision and sell on the break, you can buy back if it does happen to break convincingly above $1,375 without missing too much.